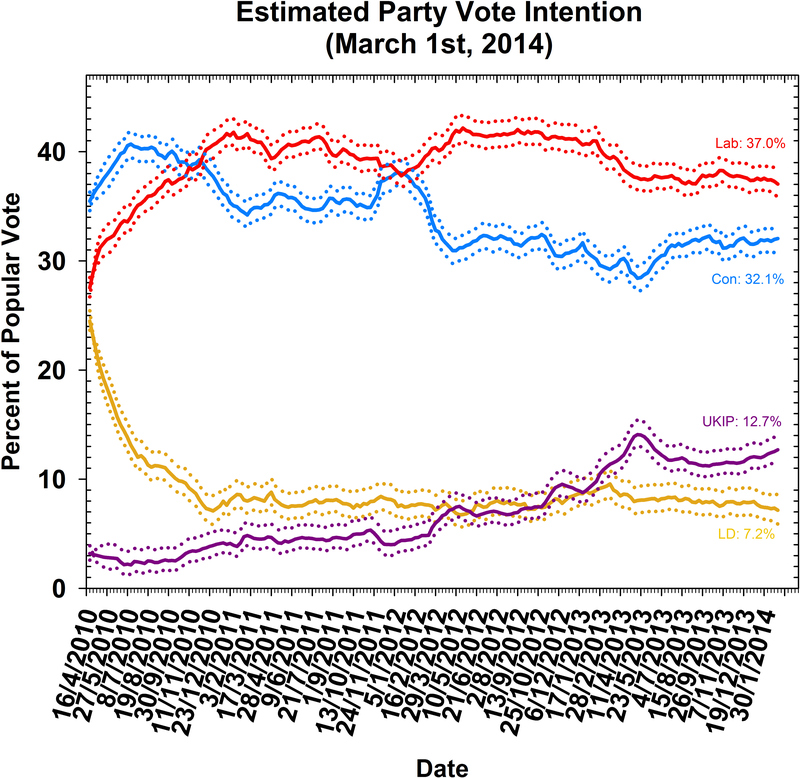 HomePolling Observatory #34: A voteless recovery so far but still time to turn the tide? Polling Observatory #34: A voteless recovery so far but still time to turn the tide? This is the thirty-fourth in a series of posts that report on the state of the parties as measured by opinion polls. By pooling together all the available polling evidence we can reduce the impact of the random variation each individual survey inevitably produces. Most of the short term advances and setbacks in party polling fortunes are nothing more than random noise; the underlying trends – in which we are interested and which best assess the parties’ standings – are relatively stable and little influenced by day-to-day events. If there can ever be a definitive assessment of the parties’ standings, this is it. Further details of the method we use to build our estimates of public opinion can be found here. On Wednesday, George Osborne will get up to deliver what is certain to be the sunniest Budget statement of his Treasury career. All the statistical indicators now point to a robust recovery – steady growth in GDP, falls in unemployment, and rising business and consumer confidence. The cloud on the horizon for Osborne and his Conservative colleagues is that there is, as yet, little evidence that the improving economic climate is improving the government’s political fortunes. With each passing month, the lack of any meaningful movement in the polls increases anxiety about a voteless recovery in 2015, with British voters unwilling to give the government any electoral reward for the much discussed “tough decisions” of the past few years. . The story from February’s Polling Observatory estimates is much the same as in previous months. Once again, we can report that these suggest no dramatic changes in the status quo that has been in place since last autumn. We estimate Labour support this month at 37.0%, down 0.8% on January. The Conservatives come in at 32.1%, up 0.2% on last month. The overall gap has thus narrowed to under 5%, but both parties’ shares are broadly in line with previous estimates. There is not yet any evidence of sustained movement away from Labour or towards the Conservatives. We estimate UKIP support at 12.7%, up 0.9% on last month, and our highest estimate for the party since their peak after last May’s unexpected local election triumphs. The approaching European Parliament elections should provide a favourable environment for UKIP, so they may see further increases in support in the coming months. The Liberal Democrats have endured another poor month, and our estimates place them at 7.2%, the same as last month. Time will tell whether Nick Clegg’s new strategy of direct engagement with UKIP will help to reverse his party’s long polling slump. There are, however, some green shoots of recovery in other polling. In YouGov’s regular tracking poll of government performance on the economy, the share saying the government handling the economy well now stands at 41%, up 16 percentage points on its low point in the summer of 2012, and the highest level seen since December 2010. The share rating the state of the economy as “bad” stands at 45% with the same pollster, which sounds pretty awful but is in fact the lowest figure recorded in this Parliament. For most of 2011 and 2012, between 70 and 80% of voters took a dim view of economic conditions. Finally, YouGov’s “feel-good factor” index – the balance of households expecting things to improve minus those who think things will get worse – now stands at -20. Once again, this sounds bad but we must factor in a general Eeyorish tendency in the British public – the last time the figure was this high was in the first half of 2010, when Labour staged a sustained rally in the polls in the run-up to the 2010 election. Other pollsters tell a similar story – Ipsos-MORI’s economic optimism index has shown a sustained run of strongly positive figures, the most positive since the beginning of New Labour’s government in 1997. Osborne can take additional comfort from his sobering experience in 2012 – when his “omnishambles” budget was followed by a sharp decline in Conservative poll ratings – while this was not the public reaction he was hoping for it did at least demonstrate that the budget is one of the rare political events with some capacity to move public opinion. With the public finances improving at last, he may hope to be able to offer enough goodies to voters to move the dial in the other direction this week. While public opinion remains in a steady state, there are thus reasons for hope for government politicians: voters have noticed the improved economic climate, though they have yet to give the government any credit for it. The government can take further hope from polling history: our analysis of historical polling trends, suggest that Labour still have plenty to worry about over the next 14 months. Our Polling Observatory forecast model, which analyses historical polling trends to project the current state of public opinion forward to election day, suggests the likeliest outcome currently is a modest recovery in the Conservatives’ poll share, sufficient to make the next election a statistical dead heat in vote shares. This outcome would likely still translate into a small Labour majority because of biases built into the electoral system, but this projection highlights the very real possibility of another hung parliament if Labour cannot maintain its poll lead in the coming months. The evidence from past election campaigns suggests that there is currently still plenty of time for opinion to change, and the economic opinion data provides one strong reason to suggest that it may do so. Each month from here on in is crucial for the parties’ electoral fates: the link between current polling and subsequent election results becomes steadily closer with each passing month in the last year of a Parliament, making a 5 point lead harder and harder to overhaul. There is still time for the parties, and their leaders, to change their electoral fates, but it is starting to run out.